New 27-inch iMac for 2014 rears its head, but will it be 4K? Apple just introduced a new lineup of speedier MacBook Pros, but it doesn't appear to be resting on its laurels. 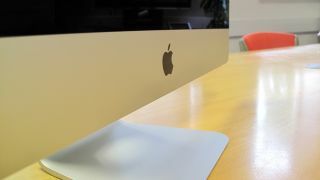 A new leak reveals a new larger iMac mdodel is slated for release sometime this year. The French tech site ConsoMac first spotted an internal document revealing a forthcoming 27-inch iMac model. Other than the fact the new Apple All-in-One will be compatible with 64-bit versions of Windows 8.1 and Windows 7 and that it's a mid-2014 model, there wasn't any documentation indicating specs or other details. However, it isn't a stretch to think this new 27-inch model could be the recently rumored iMac featuring a Retina 4K display. The 21.5-inch iMac saw an upgrade with the recent introduction of a new lower-end model stuffing MacBook Air internals inside the larger PC. However, the current 27-inch iMacs are still the 2013 units introduced over a year ago. News of the updated iMac line comes along with rumors that Apple will also introduce a new Mac mini for the first time in two years. Before we invest too much hope in these machines, the accidental listing doesn't describe much. Although it was taken down almost immediately, the leak could have been a clerical error or another sort of slip up. In other words, don't put too much weight on the leak. The introduction of a 4K display and revival of the Mac mini would likely be announced at a press event rather than slipped into the Mac store, so we'll look for Apple to make them official at its typical September/October events.